You’re at your favorite barbeque joint, and as you’re glancing over the menu, your eyes scan the pages for those two familiar, mouth-watering words: ‘smoked meats’. The rich flavor and savory texture of smoked meats are often what differentiates gourmet cuisine from your average Joe’s backyard barbeque. So, how do restaurants always get that perfect smoky flavor that seems nearly impossible to recreate at home? The secret is simpler than you’d think and may be lying right in your backyard. That’s right; wood chips are an effective way to infuse smooth, smoky flavors into a variety of your favorite meats, fish and cheeses. 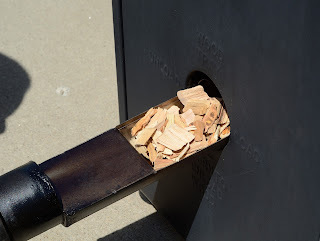 No longer do you have to rely on costly meat smokers to provide your meats with the rich flavor you crave – inexpensive and easy to use, wood chips are a great way to take your barbeque skills to the next level and create truly remarkable, fall-off-the-bone meats everyone will enjoy. 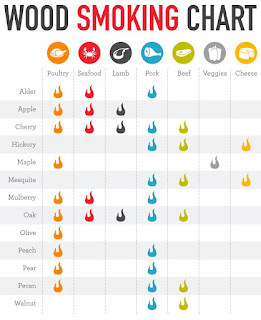 Before using wood chips to smoke your grilled meats, it is important to realize that there is a wide selection of woods to choose from, and all come with a variety of different textures and unique flavors. It is important to choose a type of wood that pairs well with the flavors of the meat, fish or cheese you are trying to smoke. While oak pairs well with any type of meat, it is a general rule of thumb that white meats like poultry pair well with sweeter woods like maple, cherry, oak and alder. Reversely, red meats like beef and pork pair well with woods that feature stronger, more robust flavors. For example, hickory, mesquite and walnut give off a bold flavor that complements heavier meats like pork and beef perfectly. Looking to enhance the subtle flavor of your favorite cheeses? The same hickory and mesquite wood chips used for your red meats can be used to add a flavorful punch to a wide variety of premium cheeses. 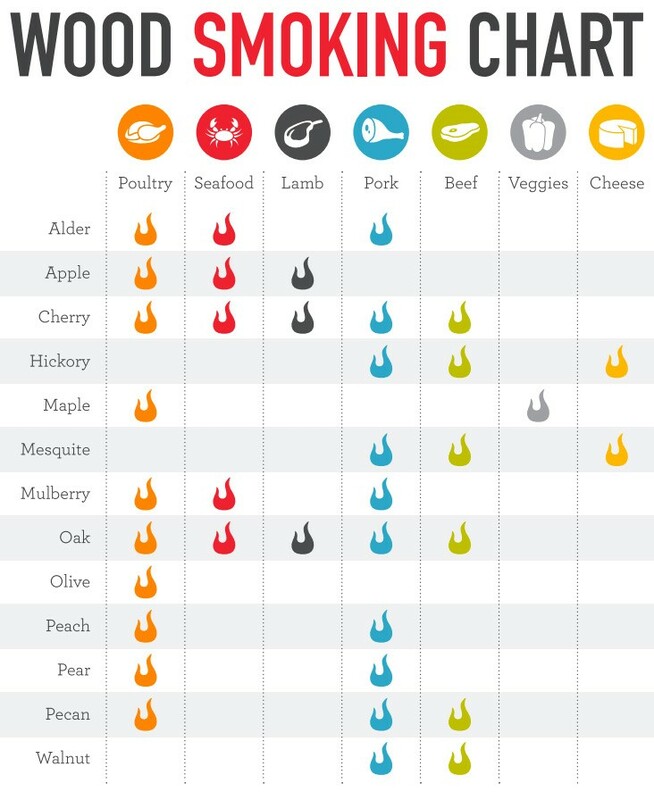 Refer to the handy wood smoking chart below to see recommended pairings of wood and meats that will help you create the best tasting smoked foods! Smoking woods come in several different shapes, including chunks, logs and simple smokes, and the sizes of the wood pieces greatly affect the overall smoking process. While there are dozens of options to choose from, barbeque pros typically recommend the use of wood chips for grilling because of how quickly they smoke and how easy they are to manage. 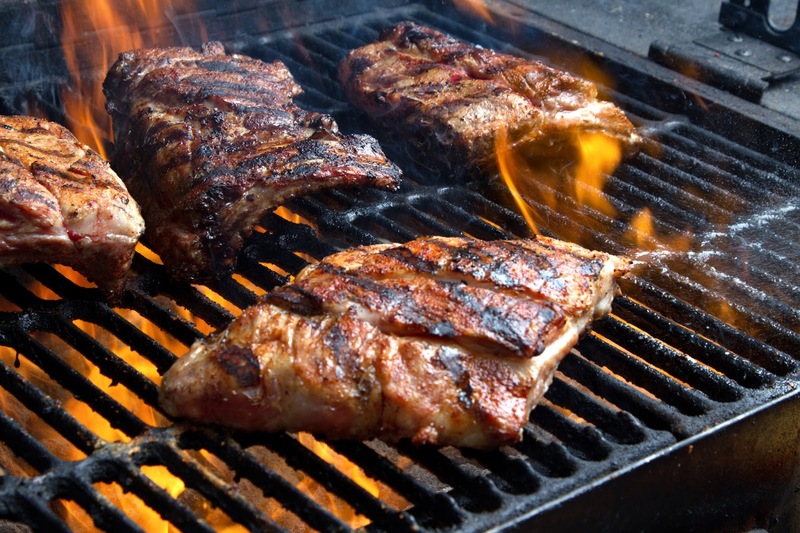 The smoking process can also vary depending on the type of grill you are using. 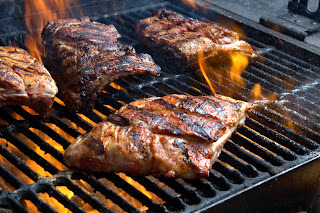 Charcoal grills, for example, are great for quickly smoking foods like chicken or fish. Simply follow the instructions below to perfectly smoke a variety of foods: After heating and dumping the coals into the grill’s pit, scatter the wood chips across the surface and close the grill lid immediately. For longer smoke times, try using wood chunks in place of chips. The chunks will last longer against the hot coals. Using a gas or electric grill to smoke your food? Simply place the wood chips over the heat source, and once they begin smoking, move them away from the heat so they won’t burn out. Remember that regardless the type of grill you are using, it is always vitally important to refrain from opening the lid during the smoking process. Be mindful that the more smoke you keep in during cook time, the richer the flavor will be upon completion! soaking wood chips in water before use prevents them from burning up faster and results in better quality smoked meats. Contrary to popular belief, this method doesn’t have any benefit to smoking and only makes the process much longer. An effective way to keep your wood chips from burning up too quickly is by wrapping them loosely in tin foil. This will keep the chips from catching fire but still maintain a steady smoke flow. 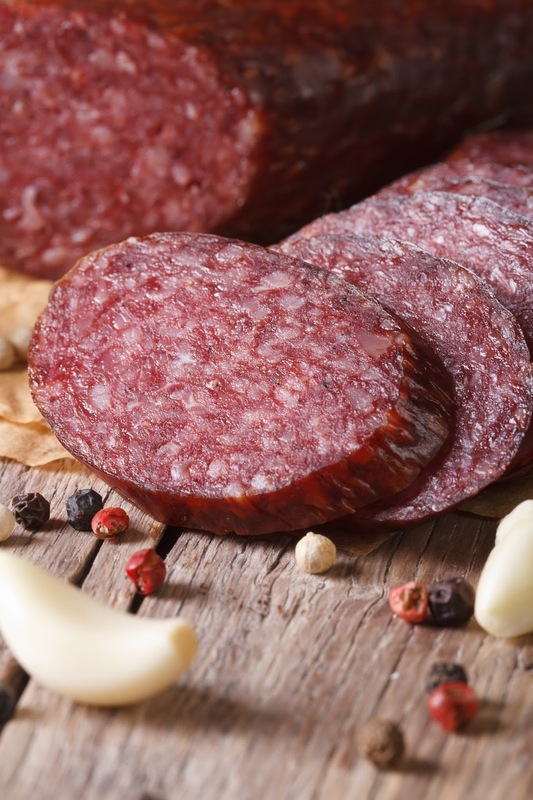 When you think of summer meats, summer sausage may be the first thing that comes to mind. An American classic, summer sausages are cured, fermented sausages that typically consist of pork and beef and are widely considered a staple to backyard barbeques everywhere. These sausages feature a deeply rich flavor with very little fat, making them a favorite among chefs and foodies alike. Where does this sausage’s name come from, you ask? Decades ago, summer sausages were typically prepared during the winter and stored until the summer, when they would be eaten by field workers throughout the day. The sausages were usually smoked to increase the shelf life of the meat and add antibacterial properties that came in handy during long periods of storage. Most people notice that smoked sausages carry a more distinct flavor and have thus become much more popular than the unsmoked versions. While many people rely on their local deli or butcher to provide them with premium smoked sausages, practically anyone can make fresh and delicious smoked summer sausages from the comfort of their own home! Follow the steps below to create your very own flavorful summer sausages from scratch! Fresh Beef Chuck / around 1.54 lbs. Pork Round / around 0.66 lbs. Grind mixture of meat through 3/16-1/4” plate (5mm). Mix F-LC in 3-4 oz non-chlorinated water, stir gently to disperse. Mix together all spices and cure and mix into meat first, then add FL-C culture solution into meat & mix thoroughly again. Ferment at 85-90 degrees Fahrenheit and 85-90% humidity for 24-36 hours. If you want your sausage to be extra tangy, leave them to ferment for 2-3 days. Place the sausage in either a smoker or place on grill and smoke with wood chips and small bowl of water on side to add humidity for about 6 hours to cooked internal temp of 155-160F to finish recipe. Enjoy or store for later. …Or if you want to continue with the drying process, smoke at 90-100F then move to 50-59F and 75-80% humidity area if continuing to dry to 30% weight loss (may take 3-4 weeks). Summer sausage is usually made from a combination of beef and pork, or simply just beef alone. While the beef to pork ratios may vary depending on what recipe you are following, it is recommended to use either ¾ beef to ¼ pork or ¾ pork to ¼ beef. Of course, you can pick which ratio to use depending on which meat you prefer, or alter the ratios accordingly. Want a sausage with a higher beef content? Try using a 2/3 beef to 1/3 pork ratio. You may also use more exotic meats, like venison, for your filling and can adhere to the same ratio guidelines as aforementioned. Choose beef with a vibrant cherry-red color—Many shoppers encounter darker purple-red colored beef in their market’s meat departments. This is common for vacuum sealed packaging, and the beef will turn to a brighter red color when exposed to oxygen. Choose pork cuts with a pink coloring—The pink coloring of pork cuts is a sign of its freshness. Remember that quality cuts will be firm to the touch as well. Always try to buy fresh meat products last—The amount of time meat products are taken out of cool temperatures should be reduced as much as possible. Never buy meat products that feel warm—Quality meat products are always cold to the touch. If you select a cut of meat that feels warm, it is probably on the verge of going bad and should not be purchased. Here’s the fun part! 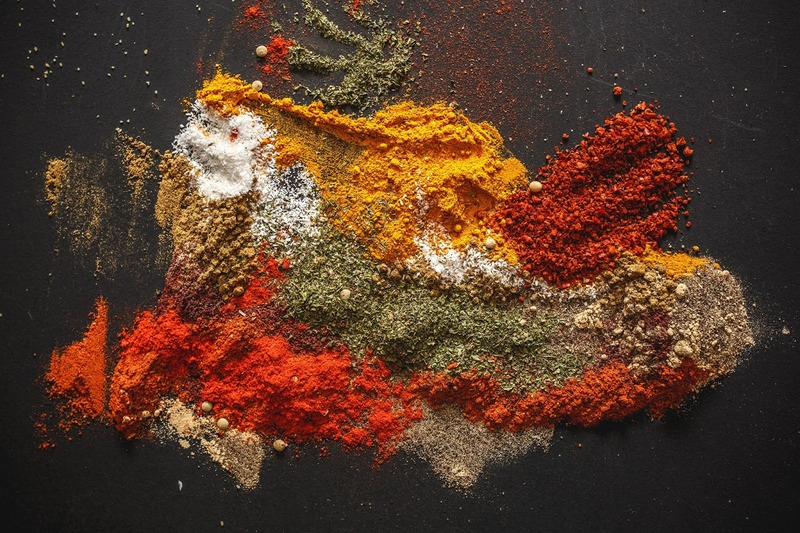 While mustard seed, garlic and black pepper are the most common spices used to season summer sausages, feel free to experiment with different spices and choose a mixture that best suits your personal palate. Several popular sausage recipes call for the use of coriander, ginger, allspice and an eclectic variety of other flavorful spices. If possible, grind the spices by hand just before adding them to the beef/pork mixture. Doing so will retain the spice’s freshness and ultimately give your sausages a more distinct flavoring. 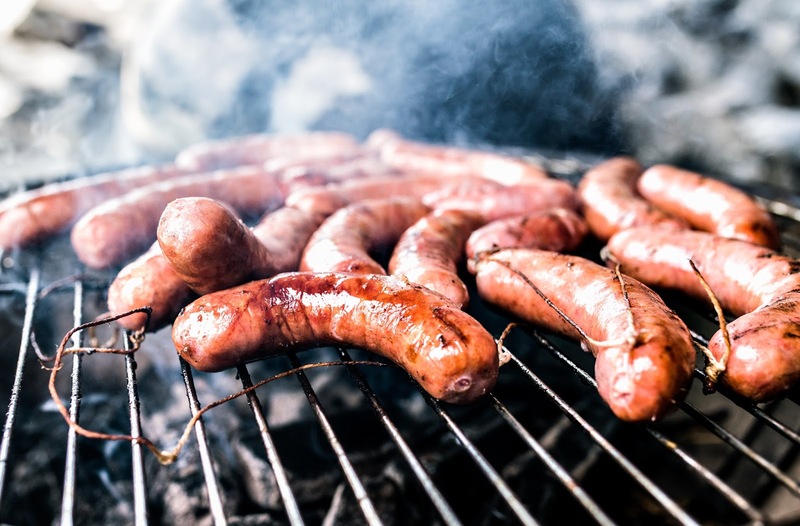 Because summer sausages are fermented meats, their production requires the usage of a meat cultures such as FL-C. Bactoferm® FL-C meat culture features bioprotective properties and are typically used in the production of fermented sausages with short or traditional production times. This meat culture is recommended in the production of all fermented meats and is noted for its ability to stop the growth of Listeria, a type of bacteria commonly found in food production facilities. During the fermentation process, the sausage’s pH drops, making it less likely to grow unwanted bacteria. Having trouble finding FL-C meat culture? No worries! Shop our inventory of premium FL-C meat cultures here! During this process, you want to make sure that the curing salt and spices are mixed thoroughly into the meat mixture. Ensuring that all of the ingredients, especially the curing salt, is mixed evenly into the meat is extremely important. If the FL-C isn’t mixed after the other ingredients have been, or isn’t thoroughly mixed in, it may compromise the entire fermentation process and result in poorly made sausages. One trick many experts use to make sure the ingredients and meat have been properly mixed is to look closely when pulling apart the mixed meat for mini mountain peaks. Meat forms peaks & valleys when vital meat proteins myocin and actin have been successfully broken down during mixing. Mix the meat until it forms a cohesive whole. Now you are ready for stuffing! In order to begin the stuffing process, you first need to get casings. While 55-60 mm casings are the most popular among summer sausages, 40 mm and up to 75mm casings are frequently used as well. There are a variety of casings you can choose from, including natural, collagen and fibrous casings. A wide variety of casings is available to purchase on our website if you run into trouble finding them elsewhere. There are also many ways you can stuff the meat inside the casings, but perhaps the most efficient is by using vertical sausage stuffers (found here). These handmade, stainless steel sausage stuffers come in small-to-large sizes for a variety of different applications and make the stuffing process much easier and more efficient. When using the stuffer, be sure to stuff the meat firmly into the casing, making sure to minimize air pockets forming inside. If you’re cooking the summer sausage and there are air pockets in the casing after you stuff them, don’t fret. While it’s best to get rid of as many of them as possible, an air pocket here or there won’t compromise the overall quality of your sausages! If semi-dry curing, meaning you are lightly smoking then drying them until weight loss is achieved, then prick the casings where air pockets are visible with sterilized sewing needle or sausage pricker. Using the information provided above, you can easily smoke any sausage at any length using a grill and some wooden chips. Use cherry or hickory wood chips if you can, for these produce smoke that complements the natural flavors of the sausage perfectly. When smoking and cooking your summer sausage on the grill, smoke between temperatures of 110 degrees Fahrenheit to 130 degrees Fahrenheit until the desired color is achieved. After this, gradually increase the temperature to 150, then 175 degrees Fahrenheit. Don’t have access to a smoker or grill? No worries! Simply turn to your handy-dandy oven to do the job for you. When cooking in your oven, start cooking the sausage at the lowest setting (which typically falls around 170 degrees Fahrenheit) and slowly increase the temperature to 190 degrees Fahrenheit until the internal temperature of the sausage reaches the target temperature. Place a 1/2" or deeper pan underneath the sausage to catch drippings. Voila! After completion, give yourself a nice pat on the back – you can now consider yourself a summer sausage expert! Making sausages at home is not only a rewarding experience, but your friends and family will be impressed with your dedication and expert cooking skills. Going from a backyard barbeque cook to a full-blown sausage maker is no easy feat, but by following our directions and browsing our website for special offers on all sausage-making essentials, you can be on your way to making gourmet smoked meats any time you’d like! As a car lover, usually traveling out side with my car.I highly appreciate this article. SMOKED MEATS is my favor food but I cook not very well and sometimes my SMOKED MEATS was salty and burnt. I really like the way you guide, its so easy to follow and i will try. Thank you so much for your share and have a nice day. Smoking meat and fish can produce some remarkably flavorful results, and it can be done without much in the way of modern conveniences. Smoking can also be used in conjunction with drying to save and preserve your meats and fish, all without the need for electricity or special equipment. This is one of my favorite food for camping trips with my family. Enjoy the outdoor at night and make some smoked meat and fish by campfire. Absolutely amazing. Smoking meat and fish can produce some remarkably flavorful results, and it can be done without much in the way of modern conveniences. Smoking can also be used in conjunction with drying to save and preserve your meats and fish, all without the need for electricity or special equipment. This is one of my favorite food for camping trips with my family. Enjoy the outdoor at night and make some smoked meat and fish by campfire. Absolutely amazing pinoy channel. LED lights have much longer life, from 30,000 to 50,000 hours. Imagine that you do not have to change your lamps for the next 20 years, especially those hard to reach light fixtures. For commercial applications long neonskyltar life LED Lights mean lower replacement costs and no more group relamping. Taken into consideration reduced maintenance costs, the ROI (Return Of Investment) time for LED Lamps can be less than 1 year. Find out the dates of next arts and fashion festival in the Singapore if you want to participate in them .Do not forget to check for Outdoor event space for rent in Singapore special and promotional offers at various hotels in Singapore during these festivals. Use online reservation facilities for reservation at theses Hotels in Singapore. These services are easy and simple to use and will end up saving lots of trouble. Last, but not least there are the exact or direct fit LED panel lights which are vehicle specific. Since not all vehicles have the same type of housing shape for the interior lights, a universal LED panel may not be available in the size and shape that you need. Vehicle specific LED panel lights are designed and led skylt utomhus created with a specific housing shape in mind. These type of lights are typically able to provide much more light output and coverage than a traditional LED replacement and panel type light. And how you can burn them so you can movies 123 watch them on your stand alone DVD player. Everything in one single package. 24/7 support team is ready to help its customers. Ahow to watch online game of thrones season 8 episode in usa uknd how you can burn them so you can movies 123 watch them on your stand alone DVD player. Everything in one single package. 24/7 support team is ready to help its customers. Had a requirement to create you a next to no term to a couple of thanks within the in the meantime as before on the point of the primary powerful thoughts you've got given ideal here.